"We have in effect put all our rotten eggs in one basket. And we intend to watch this basket carefully." Recently, Dan of "The Reader is Warned" compiled a two-part list, titled "5 Impossible Crime 'Thrillers' to Try” and "5 More Impossible 'Thrillers' to Try," which made a decent attempt at listing all the notable, high-paced thrillers with a locked room or impossible crime element, but both lists omitted the best specimen of this particular blend of crime-fiction – namely Michael Gilbert's outstanding Death in Captivity (1952). After littering Dan's comment-section with recommendations for the book, I decided to take down my copy from the shelves to see if it could stand re-reading. And it absolutely did! Death in Captivity was reprinted in 2007 by the now defunct Rue Morgue Press, under its US title The Danger Within, which came with a foreword by Tom and Enid Schantz briefly going over Gilbert's personal experiences as a prisoner-of-war in Italy during World War II. The foreword is titled "The Escapes of Michael Gilbert" and gives the modern reader an idea just how extraordinary this piece of detective-and thriller fiction truly is. 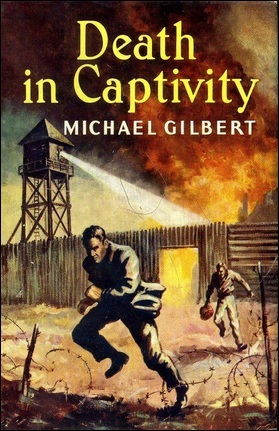 Not only are the plot and setting practically unique within the genre, but many of the events in the book were inspired by Gilbert's first-hand experiences as both a POW and an escapee in enemy territory – which gave everything a chilling veneer of authenticity. Particular the depictions of everyday life at the prison camp, the secret tunneling activities in the various huts and the occasional pestering of the Italian prison guards ("a bit of sentry-baiting"). Another aspect that sets this book apart from other World War II mystery-and thriller novels is that it deals primarily with the Fascisti of Italy rather than the Nazis of Germany. The Danger Within takes place in Campo 127, "easily the best camp" one of the prisoners had been in, but perhaps the most "comfortably lodged" group of prisoners are the six men held in Room 10 in Hut C. As a rule, the rooms were designed to hold eight men and usually overflowed with "ten or even twelve less fortunate prisoners." Captain Benucci had ordered the men, all of them notorious escapees, to occupy the same room. Reasoning that if he had "six dangerous criminals to watch, it was easier, on a whole, to have them together," but that only pooled all of their knowledge and experience in one place – resulting in "the oldest of existing undiscovered tunnels in the camp." A tunnel Colonnello Aletti, Commandant of Campo 127, claimed simply could not exist. The entrance to this tunnel lay in the kitchen of Hut C and in the middle of this cookery, set in a six-foot slab of concrete let into the tiled floor, stood a stove. A huge cauldron, shaped like "a laundry copper," which hid a trapdoor to the tunnel and could only be revealed by the combined effort of four strong men with assistance of double pulleys – effectively evading discovery by being "too big to see." I thought this was a nice little Chestertonian touch to the all-important secret tunnel that will play a key role throughout the entirety of the story. One day, the protagonist of the story, Captain Henry "Cuckoo" Goyles, crawls down to the tunnel to continue work, but discovers that during the night part of the roof had come down. Inexplicably, there's a body underneath the pile of fallen sand at the end of the tunnel. Something that should not be possible, because this person could not have gained access to the tunnel on his own nor could an outside group have entered the locked Hut C after nightfall. Even more troublesome is that the victim is identified as a Greek POW, Cyriakos Coutoules, who's suspected by everyone of being a stool-pigeon for the Italians or even a double-agent in the employ of the Nazis. Two of the special detainees in Hut C, Captain Roger Byles and Captain Alex Overstrand, had previously uttered threats to lynch Coutoules. However, their immediate problem of Hut C and Colonel Baird, head of the Escape Committee, is how to tackle the problem of a dead man cluttering the best tunnel they had. So they decide to dump the body in a smaller tunnel, located in Hut A, that had been "allotted low priority by the Escape Committee" and stage a roof collapse there, but how they move the body from one hut to another, under the nose of the guards, is one of my favorite and funniest scenes of the entire story – something of a cross between 'Allo, 'Allo (war-time setting) and Fawlty Towers (the episode Kipper and the Corpse, 1979). You occasionally get these brief burst of typical British humor. Such as when some of the prisoners are preparing a stage-play and they pick one in which one of the characters, rapturously, exclaims "Italy! Oh, it's hard to take in even the bare possibility of going there. My promised land, Doctor, which I never thought to see otherwise than in dreams." Needless to say, that line brought the house down. But, on a whole, the story-telling tends to be serious in tone, because the myriad of (potential) problems facing the POWs of Campo 127 are no laughing matter. 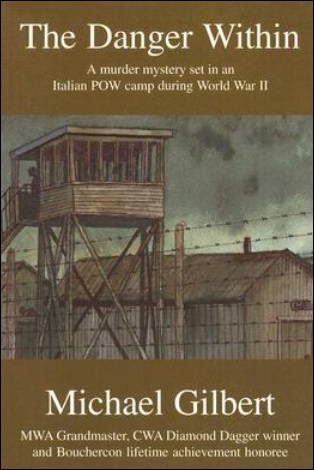 The events at the POW camp take place against the backdrop of the impending invasions of Sicily and the Italian mainland by Allies, eventually culminating in the disposal of Benito Mussolini, but the consequences of an Allied victory in Italy is a double-edged knife for both parties at the camp. On the one hand, the POWs fully realize the Germans aren't going to set free the sixty thousand prisoners in Italy and that, one day, they could simply find themselves being put on a train "to Krautland." On the other hand, the card-carrying members of the Fascist Party, such as Captain Benucci and the sinister Mordaci of the Carabinieri Reali, know they'll be put in front of a military tribunal when the Allies arrive – which would probably end with them having to face a firing squad. So the inexplicable death of Coutoules and the accompanying cloud of suspicions does very little to improve the slightly strained situation at the camp, but the situation becomes rather serious when Captain Byles is charged by Benucci with the murder of the Greek POW and is placed in solitary confinement – condemned to die in several days time. Captain "Cuckoo" Goyles is asked by the Escape Committee to investigate who killed Coutoules, why and where. And, most importantly, how his body ended up in the tunnel. In my opinion, the explanation for the impossible appearance of a body in a hermetically sealed, air-tight and blocked tunnel is as simplistic and logical as it's original. A one-of-a-kind impossibility in a completely unique crime novel that performed a perfect juggling act with its detective story elements, thriller components and spy material. Gilbert never allowed one of those elements to overshadow the other, but neither were they diluted. They worked in perfect harmony with one another. For example, the clues that will help you solve the detective story elements are provided by some of the more gruesome, thriller-ish aspects of the plot. You'll know what I mean when you get to it. The Danger Within is an impressive and perfect latticework of differing genres, which is what makes it impossible to pigeonhole the book, but the climax of the story is a fine piece of wartime fiction as the inmates of Campo 127 prepare themselves to make "The Great Crawl." A fitting end to this semi-autobiographical wartime crime story. An ending that fitted like the final piece of the puzzle that completed the whole picture of this marvelously clever and exciting story. I simply can't recommend this one enough. I'll end this review by saying that re-reading The Danger Within has inspired me to finally airlift my other Gilbert titled from the snow-capped tops of Mt. To-Be-Read. I'm not sure which titles actually reside there, but I believe they were Close Quarters (1947), Death Has Deep Roots (1951) and The Killing of Katie Steelstock (1980). So you can look forward to a review of one of those titles in the hopefully not so distant future. Finally, Kate at Cross Examining Crime and Mike of Only Detect also reviewed the book (here and here), while Sergio of Tipping My Fedora reviewed the 1959 movie based on the book (here). "But I'd much sooner have a jolly good murder in the village. A jolly good murder... would make Christmas jolly well worth it." 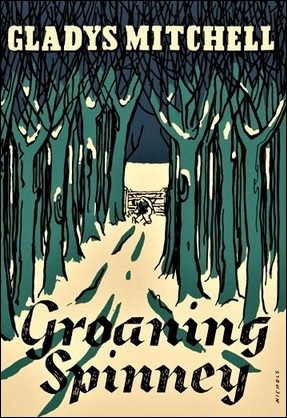 Gladys Mitchell's Groaning Spinney (1950) is the fiftieth title in her series of wonderfully written, often unconventionally plotted, mystery novels about her cackling, basilisk-like psycho-analyst and criminologist, Mrs. Bradley – described by Mitchellites as a wintry story with "a vivid, picturesque seasonal backdrop" and one of her "most satisfyingly, well-clued solutions." 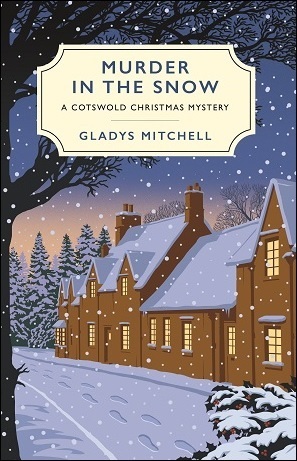 Excitedly, this book is about to be reissued as a special Christmas edition, under the title Murder in the Snow, which is scheduled for release in early November. So this fairly recent tradition of republishing classic, often obscure, Christmas-themed mystery novels continues to snowball ever larger. This year also saw the republication of Christopher Bush's Dancing Dead (1931), Anne Meredith's Portrait of a Murderer (1933) and Cyril Hare's An English Murder (1951). Curiously, the detective novel by Hare has not been reissued under its alternative title, The Christmas Murder, while Ellery Queen's The Finishing Stroke (1958) remains completely ignored in this category. But who knows? Maybe next year some of these publishers will set their sights on these kind of holiday detective stories from the United States. But for now, I'll be looking at an earlier edition of Groaning Spinney. Groaning Spinney takes place in the Cotswolds, nestled in south central England, which is famous for its ancient landscape with its rolling hills, rustic villages and charming hamlets. Jonathan Bradley and his wife, Deborah, had chosen the place to settle down and had purchased an old manor house, which came with a plot of land in a hilly, partially wooded area with "a dashing stream" and "a very well-authenticated ghost" of a nineteenth century parson, Rev. Horatius Pile – who can be seen hanging over a gate on moonlight nights. So the perfect place to raise a family. Deborah had acted as a Mrs. Bradley's Sub-Warden at Cartaret College, in Laurels Are Poison (1943), where she was introduced to Mrs. Bradley's nephew, Jonathan, which led to their engagement by the end of the book. At the time, Mrs. Bradley had "greatly desired to find place in the family circle for the lovely Deborah" and her nephew had been "the vehicle for this inclusion." So Jonathan and Deborah invited their "Aunt Adela" to spend the Christmas holiday with them in their new home, but her arrival marked the beginning of a series of events that resulted in several deaths. And it all started very innocently. On the morning after Christmas, the priestly ghost had left a trail of footprints, "like stockinged feet," in the snow and a witness claimed to have glimpsed the parson by "the snow-laden ghost-gate" at the top of the wood known as Groaning Spinney. But these locals stories of a ghost in the snow takes a macabre turn when Jonathan finds a corporeal form "slumped over the five-barred gate" and the body was "dusted over into ghostliness" by the last fall of the snow. The body at the ghost-gate belonged to one of two cousins, Bill Fullalove, who lived with his relative, Tiny, as bachelors and according to the police examiner he had died of heart-failure due to cold and exposure, but a year ago he got himself medically examined for a life insurance policy and the company doctor had never seen a healthier man – or "tested a heart in better condition." So could the winter cold and snow have killed a healthy and robust man like Bill Fullalove? It should be noted here that Mitchell was not necessarily a mystery novelist who was known for crafting elaborate, overly ingenious, murder methods, but she did come up with a couple of original gimmicks (e.g. The Man Who Grew Tomatoes, 1959) and this definitely one of them. A murder method as cold and clever as the one from Rex Stout's "A Window for Death" (collected in Three for the Chair, 1957). Interestingly, the death of Bill Fullalove turns out to be nothing less than a perfect crime, because Mrs. Bradley admits that obtaining proof of murder is practically impossible. She does piece together how the murderer brought about heart-failure, based on such clues as dog-chains and trees, but dealing with the guilty party requires an unorthodox approach. Mrs. Bradley admits around the halfway mark that, "in this instance," revenge is her aim. And if you have read Speedy Death (1929), you know what she means by that. There are, however, other problems complicating the matter of the dead man at the ghost-gate. An anonymous letter writer is littering the village with poison-pen letters and one of them suggests that the dead man had been murdered – even accusing the local doctor of "conspiring to hush it up." Another letter tells the cousin of the dead man, Tiny, that the police suspects murder and advises him to prepare for an exhumation. The doctor observed that this "sort of round-robin stuff can have serious consequences" and these words prove to be prophetic when the poisoned remains of the Fullaloves' missing housekeeper, Mrs. Dalby Whittier, is found in a deep dip in one of the farmer's fields. And from these various plot-threads, Mitchell weaved an intricate, but discernible, tapestry of a potential insurance fraud, disputable identities, missing animals, wholesale blackmail and a double murderer. Mitchell really deserves praise here, not only for crafting a clever and well-imagined plot, but also for telling the story in clear and straightforward manner without getting entangled in a confusing web of plot-threads, which (admittedly) was not something she always succeeded in doing – c.f. Hangman's Curfew (1941) and The Worsted Viper (1943). One other thing that has to be mentioned about the plot is that certain plot-strands evidently took their cue from Agatha Christie's Peril at End House (1932), which pertained to both the insurance policy and an attempt to use a "ghost" to bring the murderer to heel. Nevertheless, that should not be taken as criticism of Groaning Spinney, because the book by Christie had only been used as a source of inspiration. But you'll see what I mean when you get to it. If Groaning Spinney has any flaws, particularly when measured against her own body of work, it is that the murderer's revelation does not come as an earth-shattering surprise and the ghost-element is not used to full-effect. Mitchell can do so much better with ghostly legends. I also missed the presence of one of her convincingly drawn, plucky children or teenage characters. Such as Mrs. Bradley's great-nephew, Denis, who provided the opening quote for this blog-post. I believe the presence of such a character would have greatly enhanced the already excellent atmosphere and cast-of-characters of the book. Otherwise, Groaning Spinney is pleasantly lucid, well-written and lively entry in the Mrs. Bradley series with an ingenious murder method and an active detective with a sense of humor. But what is perhaps the strongest aspect of the book is its splendidly realized country-side setting. Whether it is the wintry, snow-laden landscape of the opening chapters or the approaching spring thaw of the later half, you have to admit that bringing a setting to life with mere words is a talent she shared with her Arthur W. Upfield. So this was an auspicious, and early, beginning of my 2017 reading of the Yuletide Mystery Novel. There are three additional titles on my TBR-list and might add one or two more to that list. So stay tuned. "And keep your eye on that fisherman. Don't let him do any thing funny." Nearly two years ago, I read Harriet Rutland's splendid (and splashy) Bleeding Hooks (1940), which had been reprinted at the time by Dean Street Press and their new edition is introduced by our resident genre-historian and scholar, Curt Evans, who listed additional titles in his preface of detective novels with a fly fishing background – including John Haslette Vahey's Death by the Gaff (1932). Secondhand copies of the Vahey title tend to be on the scarce side, but recently came across an inexpensive reprint edition in the catalog of Black Heath Edition and remembered Evans had mentioned it in his introduction to Bleeding Hooks. So I immediately reeled in a copy of the book. This new edition of Death by the Gaff has been reissued under Vahey's most well-known pseudonym, "Vernon Loder," which is a name you might recognize from the recent Detective Club reprint of The Mystery at Stowe (1928). A pleasantly written, old-fashioned detective story about African blowpipes and poison-smeared thorns, but the plot was hardly innovative. Fortunately, the same can't be said about his fly fishing-themed mystery novel, which definitely had a touch of originality, inventiveness and some of the splendor of the 1930s, Golden Age detective story. 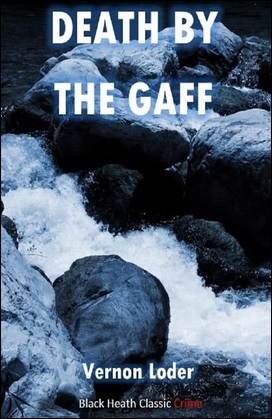 Death by the Gaff takes place in Cwyll, North Wales, where the Horn Hotel caters to ardent anglers, professional and amateur alike, but recently a particular unpleasant specimen of the fisherman had taken up residence at the hotel, Solomon Hayes – an "elderly Don Juan of an offensive sort." Hayes acted as "a perfect pig." A man who treated his fellow anglers as poachers and came close to trading blows with a local fisherman, Peter Hoad, who had accidentally taken one of his nets and was "practically stigmatised as a thief." Hayes also made two enemies at the hotel, Edward Bow and Robert Chance. The latter of those two actually had a tussle with Hayes when tried to dissuade Chance from fishing in the same pool as he was trying his luck in, which is a discussion that ended with "a not too heavy uppercut." Hayes immediately consulted a lawyer and visited the local police station to press charges against Chance. So pretty much everyone had enough of Hayes and a round-robin petition was signed, which demanded his removal from the hotel. On top of that, Caroline Hayes turns up one evening in response to an anonymous letter she received suggesting that her husband had been fooling around with a local girl. However, by the time she arrived, Hayes had gone missing. And he would not be found until the following day. Hayes' body is spotted in the water of a natural pool, trapped beneath a jutting rock, just above the lip of a waterfall, but when the body is retrieved from the pool they find "a round, raw wound" in the left side of the throat – suggesting a blow from a steel gaff-hook. 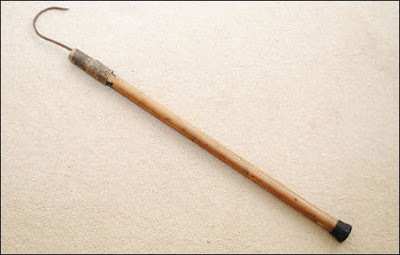 A gaff is a big steel hook on a stick and is used to land a salmon. Coincidentally, there was a lost gaff at the time Hayes went missing and the search for this potential murder weapon is what drives a large portion of the investigation, which is done by both a police inspector and two self-appointed amateur snoops. Inspector Parfitt is the policeman in charge of the official end of the investigation, but a good portion of the relevant detective work is done by two friends, Harry Wint and Joan Powis, who find traces of blood on one of the wooden sleepers (railway tie) in one of the train tunnels – which are used as a short cuts by the local fishermen and employed by Hayes, and his girl, as a secret rendezvous spot. I found that rather odd, because you would think the hillsides of Wales has better places to offer than a dark, soot-covered train tunnel for the purpose of clandestine, night-time meetings. But hey, that's just me. Interestingly, Wint and Powis come to regret their involvement and even attempt to walk back on the evidence they uncovered, which they do on account of the person who got arrested and committed for trial at the assizes. Wint and Powis concoct a theory that would explain Hayes' death as an unfortunate accident. Surprisingly, their theory seemed to hold water when a diver found a gaff at the bottom of a pool. On a historical side-note, the scenes with the old-time, hard-hat diver, complete with a bell-helmet and surface air-pump, were fascinating to read and not a "character" often encountered in vintage detective stories. I'm only aware of two detective stories in which a hard-hat diver plays a role or makes an appearance: Max Murray's The Neat Little Corpse (1950-51) and Joseph Commings' 1953 short story "Bones for Davy Jones" (collected in The Locked Room Reader, 1968). So I thought that was interesting. 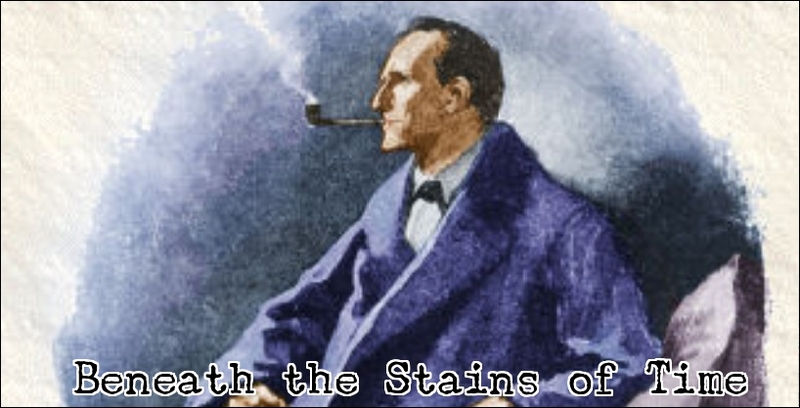 Nevertheless, Inspector Parfitt, who's "a methodical and conscientious man," gets to redeem himself and carries out a careful, time consuming experiment behind that scenes that involves a zinc bathtub in his attic and gallons of water from the river Cwyll – an experiment that got results which "filled his mind with triumph." This patient, time-consuming, but scientific, approach to the problem and the various experiments (one of them involving a wax dummy) makes this book closely related to the work of R. Austin Freeman, Freeman Wills Crofts and even John Rhode. Only problem is that Vahey decided to take the humdrum route once the finish-line of the story came in sight. Death by the Gaff is full of local color and beautiful descriptions of the Welsh countryside, rivers, whirlpools and waterfalls with a pleasant concoction of professional police work and amateur detection, but the revelation of the truth felt like a dud. As if all the energy had gone out of the plot. The murderer's identity is logical enough (a bit obvious perhaps) and the motive of this person was signaled early on in the story, but the solution simply felt underwhelming and somewhat uninspired. Even the murderer almost completely deflated when the inevitable knock on the door came and only made a halfhearted attempt at committing suicide, which was easily deflected by the inspector. After that, the murderer merely expressed his wish to be hanged as soon as possible. Once again, the solution makes sense and is competent enough, but the ending lacked the energy that was present in the preceding chapters of, what was until then, a very good sporting mystery. So this is really a story in need of a better ending and burdened with an anticlimactic ending. However, I'm probably selling the book short here by nitpicking the ending, because, on a whole, this was a really good read. It's just that the ending was not as impressive as the rest of the story. I really wish my enthusiasm had sustained itself into the final chapter and would not have to end this review with a splash of cold water, but that's what I got out of the story. So there you have it. Another hacky review I botched with my nitpickery. Oh, well, I'll try to do better with the next one. Finally, I mentioned in the opening of this blog-post a short list of mysteries with a fly fishing background and three of those titles are currently residing on my TBR-pile, which are Cyril Hare's Death is No Sportsman (1938) Josephine Tey's The Singing Sands (1951) and Ngiao Marsh's Scales of Justice (1955). A fourth title, Double Cross Purposes (1937) by Ronald A. Knox, is available as an ebook. That leaves only Nigel Orde-Powlett's The Cast of Death (1932) as one of those pesky, hard-to-get and out-of-print titles, but I can easily the knock the others of my list and I'm kind of tempted to do so. But we'll see. So stay tuned! "Blackmail is the most dastardly of crimes." Margaret Lane van Patten was an American mystery novelist from Portland, Oregon, who moved to London, England, after her marriage to Frederick van Pattan in 1913 and used her adopted homeland as a backdrop for thirteen detective novels – eight of them reportedly star her cast of series-detectives. You read that correctly. She wrote a score of mystery novels, under the name of "Gret Lane," about a cadre of (semi) amateur detectives. Kate Marsh is the protagonist of the series and the de facto ringleader of the group, who rubs her nose whenever she gets a hunch, which tells her mystery writing husband, Tony, that another body is waiting for them just around the corner. She has pair of partners-in-crime in John Barrin (late of Scotland Yard) and his homely wife, Jennie. This group is rounded out by their Chinese friend, Min Ling, who runs an antique store and Tony's foul-mouthed parrot, Blaster Murphy, who had "sailed the seas on tramps and whalers" and acquired a sailor's vocabulary – scandalizing people unaware of the bird's seafaring vernacular with a torrent of "explicit adjectives." I'm not going to the lie to you, the parrot was my favorite of the gang. This eclectic group of detectives made their first appearance in The Curlew Coombe Mystery (1930) and would go on to appear in seven additional novels, such as The Lantern House Affair (1931), Death Visits the Summer-House (1939) and Death in Mermaid Lane (1940), but I decided to go with the last one in the series. 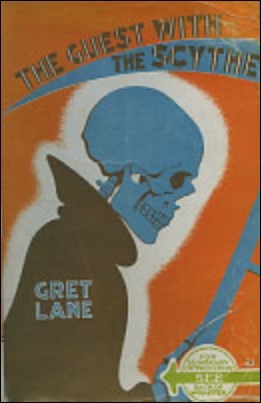 The Guest with the Scythe (1943) was not the only the last book about Kate Marsh and her close-knit group of friends, but also the final book Lane wrote during her lifetime as she passed away the following year. My reason for selecting this particular title was the backdrop of a residential spa, in rural England, which became a shelter for people who fled their towns and cities during the Blitz. And the war has a noticeable influence on the characters and events within this story. White Owl Cove is the home-base of the series and the opening chapter tells how the war has affected that tiny village on the Devon coast. All "the able-bodied men went to sea" and "the young women flocked daily to a near-by munition factory." The elderly people took care of the children and the children did their part by knotting nets for the purpose of camouflage. Barbed-wire, concealed gun emplacements and soldiers appeared on the shore and cliffs. Kate and Tony Marsh had handed over their semi-detached cottage to "six old ladies who had been blitzed from their Home for Needy Gentlewomen" and had temporarily moved in with their good friends, Mr. and Mrs. John Barrin – who live right next door. Tony had also gone to sea on a Plymouth minesweeper, but was invalided out of the army with a badly injured shoulder. So this was an interesting snapshot of the effect the war has on a small, coastal community, but the story moves away from White Owl Cove after the first chapter. And the reason for the change in scenery is an unexpected visit from Inspector Smith, of Westbridge, who tells them they can stay at the small, but first-rate, guest house owned by his sister, Mrs. Carter. There is, however, a catch to this generous invitation. Publicly, they'll be staying at the residential spa to get treatment for Tony's shoulder, but the reason why Mrs. Carter really wants them there is to bait a trap for a blackmailer. A ruthless specimen who drove one of her guests to take his own life. The victim was a young man, named Benson, who was terrified at the prospect of having to serve in the army and when papers were stolen from his room he went out to a field and shot himself. He was brought back in dying condition and confessed to Mrs. Carter that there was "a clever, wicked blackmailer" among her guests. So the entire gang descends upon the guest-house of Waterside, in Wellwich, where they're confronted with a large, sprawling cast of potential suspects. There are, all together, sixteen guests and with all the side-and series characters you're looking at a playing field with roughly twenty-five pieces on it. What they find within this large, but closed, circle of people is more than just a blackmailer. One of the guests they originally pegged as the blackmailer turned out to be merely "a curious busybody," who, like Don Quixote, "tilts at the windmills of rudeness in defense of civility," which he demonstrated when he employed, what could be construed as, blackmail material to publicly reprimand a pair of snobs, Mr. and Mrs. Wilson. But they also come across a potentially amorous prowler, literal kissing cousins, an invalid, two elderly, devoted twins and an old-fashioned opium-addict. Oh, they also find the murdered remains of one of their fellow guests! Back home, Tony had prophesied that they would "bag a brace of corpses," because they "always do." He was right on the money. One night, Kate and Tony were awakened by their dog, Taffy, who heard something outside the french windows and what they found was the body of one of their fellow guests, Mrs. Lee, laying underneath her bedroom window – twisted, bloodied and evidently very murdered. Interestingly, what immediately eliminated the possibility of an accident or suicide were not the various head wounds, but the fact that the murderer had replaced the blackout curtain after Mrs. Lee was thrown out of the window. It's one of those little historical details I always love to find in detective stories from this period and here it has some relevance on the plot. The second, brutally murdered victim is found when the opium-angle leads our group of detectives to the rooms of a fortune-teller, Ismar the Palmist, where they chance upon a dead man in the waiting room with an ominous worded note pinned to it, which is "a warning to the curious" and ended with "busybody, beware." Obviously, this note was meant as a hint to Kate to keep both her nose and her friends out of the murderer's business. A hint stubbornly ignored by Kate and this makes the murderer want to spray death "like a machine-gun" (i.e. mass murder) at the resort. 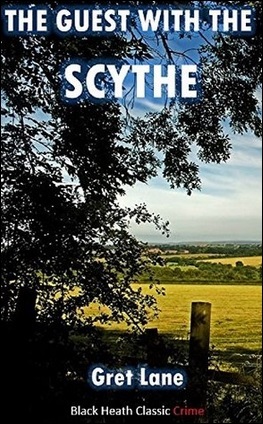 The Guest with the Scythe is a pleasantly written, engaging and occasionally amusing mystery, but as a story of detection and ratiocination the book is not all that impressive. One of these shortcomings is the thread-bare, almost non-existent, clueing. Kate stumbled to the truth when the murderer made a slip of the tongue, but this happened in the final twenty, or so, pages of the book. A second, very minor, clue was never shared with the reader. But the worst thing is that these scraps only gave her an idea who had committed the murder. She had to wait for a written confession by the murderer to fill in the gaps. So the conclusion to the story leaves me in two places. On the one hand, I can't say this was an unpleasant or badly written book, but the overall plot turned out to be very poor indeed. I suppose this is one of those series you have to read for the characters rather than the plot (like the Lockridges). However, the book was written shortly before Lane's passing and the whole dying process may have negatively impacted the quality of the plot. I'll probably try one of the earlier ones, such as The Lantern House Affair, before making up my mind about this series. Something that has become very easy, because Black Heath Editions reissued nearly all of Lane's work. So I'll come back to Lane, Kate Marsh and the gang sometime in the future for a second opinion. Finally, allow me to draw your attention to my previous review, which is very long rundown of all the short stories in a 430-page anthology, The Realm of the Impossible (2017), that gathered more than twenty impossible crime stories from all over the world. 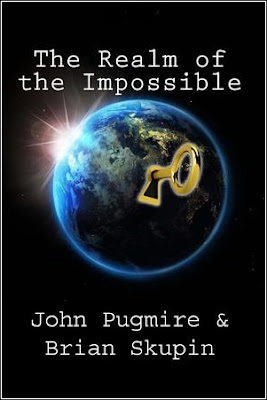 "I do not believe in miracles when murder is being considered..."
Recently, the independent publisher of impossible crime fiction, Locked Room International, released a massive, 430-page anthology, The Realm of the Impossible (2017), which was edited by John Pugmire and Brian Skupin. This collection comprises of 26 short stories and 12 anecdotes of real-life examples of the locked room problem that came from more than twenty countries scattered across this Pale Blue Dot of ours. Some even crossed time-and space itself. So the assortment of stories in this anthology is genuinely wide and varied. I've decided to take down its content in a long, drawn out blog-post and won't waste too many words on this introduction. I only want to point out that, if you're reading this on the front-page of the blog, to click on "Read More" for the entire review. Yes, I know. I should not have to point out the obvious, but usually don't break up my reviews. Right, now we got that out of the way, let's get to it. Paul Halter's "Jacob's Ladder" opens this anthology and places his most well-known series-character, Dr. Alan Twist, in the comfortable seat of an armchair detective and he listens to a peculiar story related by a former French policeman at the Hades Club – a tale so implausible that even the presence of the supernatural can't properly explain it. The story takes place in the late 1930s, in France, where the broken body of a man, named Jacob Amalric, was found on the stony bank of a pond. His wounds were consistent with a fall from a great height, but the problem is that ten miles in any direction there are were no buildings, cliffs or perches for the victim to have been thrown off of. And to add to mystery, the victim lately had religion on his mind and claimed to have seen "a golden ladder reaching to the sky." A ladder he was intended to climb. It took the teller of the story a week of sleepless nights to work out the solution, but Dr. Twist picked apart this conundrum in less than fifteen minutes and reader can do the same – because the narrator provided the reader with all the necessary information and clues to arrive at the same conclusion as Dr. Twist. So the combination of scrupulous fair play and the fairly original nature of the impossible crimes makes this a strong opening story. I believe stories like these make the case that Halter is better suited for the short story form, because they highlight his strength (plotting) and underplay his weaknesses (characterization, settings). A note for the curious: one of the murders in Mack Reynolds' The Case of the Little Green Men (1951) poses a similar impossible problem as "Jacob's Ladder," but have to admit that Halter imagined the better of the two solutions. The next story comes from the pen of Christianna Brand, titled "Cyanide in the Sun," which had not been reprinted since its original appearance in the now defunct British newspaper The Daily Sketch in 1958. Brand blended the sly, prominent poisoner from the classic detective story with the deranged serial killer of post-WWII crime-fiction, but added an impossible angle to some of the deaths. Sunnyside Guest House, in Scampton-on-Sea, is the setting of the story and the resort has been the scene of several of the infamous "Cyanide Murders," but the perpetrator had not struck for months and guests only feel uneasy now at the idea of unknown murderer strewing poison about the place – until a warning from the killer arrives ("prepare to meet your end"). Precautions are taken by a group of six guests, who share a hamper of food between them, which excluded any prepared stuff that could be "doctored in advance." Nevertheless, one of them ingested a fatal dose of poison and dies. Brand crafted a slightly unusual story here, lacking a proper detective character, with an even more unusual, but clever, resolution ("left-handed"). My only complaint is that the poisoning method was rather obvious, but, perhaps, I have read too much Paul Doherty. Because this is exactly the kind of impossible poisoning you find in his detective stories. "The cautious murderer, in his anxiety to make himself secure, does too much; and it is this excess of precaution that leads to detection." Early last month, I became acquainted with the writing of James V. Turner through one of his Rev. Ebenezer Buckle novels, The Fair Murder (1933), which is part of a lamentably short-lived series published under the name of "Nicholas Brady." Four of the five titles in this series were released in a short burst during the early 1930s with the last one appearing a decade later in 1944. I was favorably impressed by the extraordinary and increasingly darkening plot of The Fair Murder, told as a surprisingly conventional detective story, which convinced me to move as many titles from this brief series from my wish list to the big pile – a task that proved to be ridiculously easy. 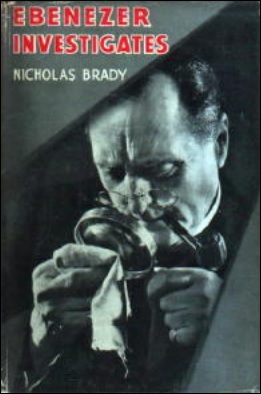 Nearly all of the Nicholas Brady titles are rarities on the secondhand book market and acquiring a copy will cost you a pretty dime. John Norris of Pretty Sinister Books mentioned in his review of Ebenezer Investigates (1934) it took him almost 15 years to find a copy and had to cough up $85 to acquire it. Fortunately, four of the books were reissued last year by an independent publisher, Black Heath Editions, who sell their books for a buck a pop. So I was able to pick up the book Norris chased for more than in a decade in less than a month and at a fraction of the price he paid for it. Life isn't fair, is it? 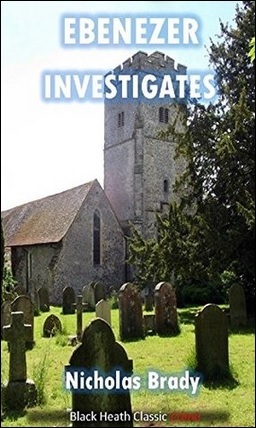 I picked the previously mentioned Ebenezer Investigates, the next-to-last book in the series, which takes place in the small, quiet village of Dowerby. A place that has not felt "the touch of unnatural death" for more than a hundred years. There are, however, more than enough everyday problems and most of them were deemed "unfit for polite conversation." One of the forbidden subjects was talking openly about the three-hundred pound debt the village incurred on the construction of Village Hall, but the contractor, Harry Cross, is not to be ignored and pesters the villagers with demands to be paid, which makes him such a fearful pest that he becomes the new bogeyman used by parents to intimidate their disobedient children – who were now being told that "Harry Cross will have you." However, the locals understood they had to be freed from this debt and decided to hold such "a bazaar as had never been heard of in the county" and elected their parson, Rev. Ebenezer Buckle, as chairman of the Organizing Commitee. Several months of hard, selfless work were invested in putting together the village bazaar and the event promised to be a huge success. The "most attractive part" of the bazaar's program is a village-wide treasure hunt for two golden sovereigns and everyone who pays their two shillings to enter the competition receives a clue in riddle-form. So, once Rev. Buckle had unburdened himself of the responsibility of his flower stall, the mystery-addicted parson entered the treasure hunt himself, but his clue brought him to a ditch that ran along the foot of the railway embankment and there he caught "the glimpse of something blue" on the other side of bridge – laying at the bottom of the trench. When he came closer, the blue thing turned out to be the body of one of the village girls, Constance Bell, with the handle of a knife protruding from a "ghastly wound" in her throat. As you'd expect, Rev. Buckle is not going to sit idly by as a murderer stalks the grounds of his own village and unapologetically inserts himself into the investigation. And how! The title of the book may be dull and unimaginative, but aptly describes the parson's role in this story, because he's at the front, back and center of the investigation. Luckily, Chief Constable Kail holds a favorable opinion of the amateur criminologist and accepts his help in untangling the litany of complications that this murders brings with it. One of these many complications concerns Constance Bell's rumored promiscuity and the time she spend in London, which may or may not have something to do with a prominent member of the Dowerby community, but the detectives also have to poke around the (emotional) wreckage of her parental home – muddled by the disappearance of her mother and 3-month-old baby brother. The water is even further muddled by her obstinate father, who refuses to talk, and consequently has to be held as a material witness at the police-station. And then there are such problems as to why Constance was standing in a ditch, filled with three inches of water, when she was stabbed and why was a piece torn from her blue frock near her ankles. What happened to the book she was seen carrying around the bazaar and how the murderer manage to lug around a big, cumbersome carving knife (stolen from the village fete) without being seen. This apparently intricate maze of clues, differing plot-threads and misdirection will fully occupy the attention of any armchair detective and I'll freely admit that all of the bedevilment lead me down the wrong path regarding a vital plot-point, which made the startling simplistic solution a genuine surprise – one that came with a least-likely-suspect as killer. However, this person was being too clever and did too much to obscure the trail, which is what got this person noticed by Rev. Buckle. But the murderer was still clever enough to leave behind any actual evidence that could be brought into court. So the person had to lay a trap and resort to fabricating evidence in order to ensnare this person. I'm aware that not every reader is charmed when a detective, especially in a classical mystery novel, goes down that route. Nevertheless, in this instance, I believe it fitted the plot of the story and the parson should be forgiven this indiscretion. If only for the wonderful performance he gave away in this book. A role that covered more ground than just detective work. Not only did Rev. Buckle played the part of amateur criminologist, but also performed the role of enthusiastic botanist who practically chased everyone away from his stall with his intimate knowledge of flowers. Even more importantly, he never forgot his clerical duties to the village and was seen preaching several times from the pulpit, but also provided pastoral care when he mended a badly damaged marriage towards the end of the story ("the best piece of work" since "I was ordained"). This made Rev. Buckle a more well-rounded character that you can't help but like and admire. And invites you to read one of his other cases that were mentioned in passing. Luckily, The House of Strange Guests (1932) and Week-end Murder (1934) are currently residing on the semi-sentient hillside known as my TBR-pile. On a whole, Ebenezer Investigates is arguably one of the better village-set mystery novels with a rock-solid, but relatively simplistic, plot and a solution that beautifully explains the clutter of complications that preceded the final chapters. Even the location of the two hidden sovereigns (from the treasure hunt) are revealed in the final pages. And what's more, if you paid attention to the opening chapters, you can probably make an educated case about their hiding place. Particularly when you know who hid the coins and the recurring theme in the riddles that were handed out as clues. So what's not to like? Well, my next read is going to be that new locked room anthology, The Realm of the Impossible (2017), but might precede my mammoth (or two-part) blog-post with a review of Kindaichi or Case Closed.